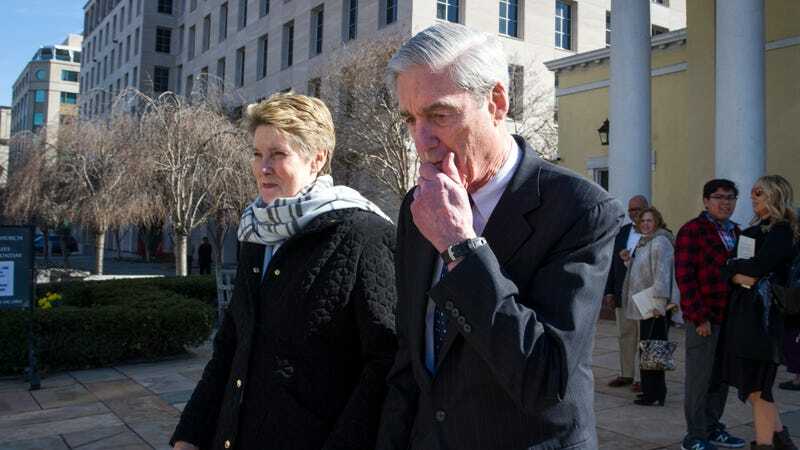 Robert Mueller (r) and wife Ann. Attorney General William Barr sent a letter to Congress on Sunday summarizing special counsel Robert Mueller’s two-year investigation into Russian interference in the 2016 election. The four-page memo quoted Mueller saying the investigation “did not establish that members of the Trump Campaign conspired or coordinated with the Russian government,” but Barr reached his own conclusions with regard to whether Trump obstructed justice, writing that there was no evidence supporting that claim. Now, a four-page letter may have been good enough for Aaliyah, but Democrats are contesting Barr’s conclusions, demanding Mueller’s full report be released. Among them are Democratic presidential hopefuls Sens. Bernie Sanders, Kamala Harris and Elizabeth Warren. Harris echoed the sentiment, calling for the “underlying investigative materials” to be handed over to Congress and for Barr to testify. Rep. Ayanna Pressley, who sits on the House Oversight and Financial committees, released a statement promising congressional Democrats will continue to hold the White House accountable. “What we have seen today does not exonerate the occupant of the White House from obstruction of justice nor abuse of power,” the Massachusetts congresswoman wrote. According to Barr’s summary, Mueller’s report “does not conclude that the president committed a crime, it also does not exonerate him” on the issue of obstruction. While there was no definitive conclusion, Mueller’s report “marshaled evidence on both sides,” according to the New York Times. Barr, a Trump appointee who wrote a letter last year opposing the investigation into the president, consulted with Deputy Attorney General Rod Rosenstein and other Justice Department officials before concluding there wasn’t enough evidence to charge Trump with obstruction of justice. Trump, predictably, celebrated his “total EXONERATION” even though that was precisely not what Barr outlined in his memo. “No collusion” is now expected to be a rallying cry among Trump’s supporters as they head towards the 2020 campaign. At least one pundit posited that Democrats were “on panic” setting following the release of Mueller’s findings—an argument that assumes Democrats ran, or are currently running, primarily on the strength of a collusion case. In a statement to The Root, Rep. Pressley pushed back against that assertion, saying she will continue to uphold her promise to her constituents to address “entrenched inequities and disparities” as Democrats determine what the next steps are regarding Mueller’s findings. “Our Democratic majority has proved that we are committed to both enacting legislation that’s for the people and providing oversight on this corrupt administration,” Pressley told The Root via text, adding that Mueller’s investigation had yielded 199 criminal charges, 37 indictments or guilty please, and 5 prison sentences. Is Special Counsel Robert Mueller&apos;s Investigation Coming to a Close?